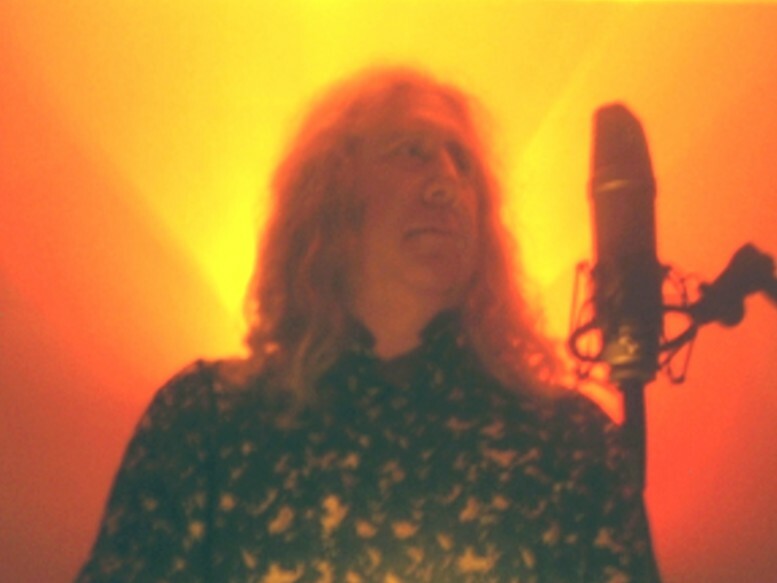 Nick Riff has been playing on the music scene since the late 70’s, and over the course of a long career he has created some of the best psychedelic music and space rock out there. He’s still at it today; right in the midst of a series of CD’s called The Riffdisc series. I caught up with the very busy Nick and had the pleasure of talking with him via e-mail to find out more about this fascinating series of CD’s as well as a look into Nick’s ideas and insights, his past and a little sneak preview into his future! First my review of Nick’s latest album, The Universe is Mental, then onto the interview! 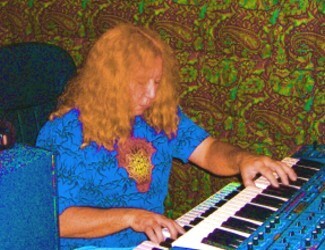 Nick Riff has been playing on the psychedelic music scene since the late 70’s, exploring many different dimensions of psychedelia and space rock. 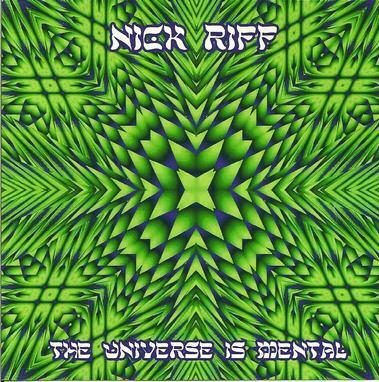 With the Riffdisc series, Nick set out to release a sequence of albums, each one focusing on a different aspect of his music. The Universe is Mental is the fourth in the series following Magick Museum, The World’s Alive (featuring Nick Riff’s Freak Element), and last year’s excellent Photon Shift. The Universe Is Mental steers away (for the most part) from song writing, to focus on a sort of organic ambient rhythmic fusion. It’s not the first time Nick has taken a more textural approach to music, even within the Riffdisc series. The lengthy track Pre-Millennium Transmissions from The World’s Alive was a deeply ambient, cosmic odyssey woven around modern jazzy rhythms. But Nick’s approach on The Universe is Mental is entirely different. Nick creates a kind of future primitivism where cosmic synths and deep organic layers meet up with ancient rhythms derived from Paleolithic sources. The music on The Universe Is Mental, however spacey, is always rhythmic. Drawing from ancient sources, the rhythms are simple, powerful, trance inducing. The rhythms played by ancient peoples were meant to guide listeners on their spiritual journeys, and I get the sense that this is exactly what Nick is trying to do here. The simple tapping of the drum (reminiscent of Native American rhythms) on the opening cut, Cast into the Firmament, almost seems to sync with the body’s natural rhythms, preparing the listener for the journey as liquid synths and deep space textures gurgle around it, like water flowing around rocks in a stream. The most complicated rhythm we get is on the second track, Paleo Vision, which presents us with a sort of prehistoric, protofunk, but the textural design and Nick’s haunting voice singing chant-like, melodic vocals continues the journey into deep space, both outer and inner. Nick can’t resist throwing in a couple of his psychedelic pop tunes on the album as well. These ones are piano and synth based, rather than being played on his usual guitar and feature Jhaz Sigeret on sax and woodwinds. They are beautiful little numbers, especially Heaven with its trippy, swirly synths. But they do seem a tad out of place amidst the intensity and mystery generated by the rest of the music on the album. It’s tempting to call the majority of the music on The Universe Is Mental ‘new age music’, but it’s all a bit too intense for that label. Nick himself likes to refer to it as ‘new age punk rock’. And while I don’t quite hear the ‘punk’ aspect to it, there are definitely subtle undertones of space rock always there in the mix, whether it is the Tangerine Dream-like electronic sequences of Where Are We Now or the strange, alien voices and analogue space whooshes of Implant Procedure Explained or the throbbing intensity of the Eastern influenced Sumerian Spaceport. If you’ve heard some of Nick’s other stuff and are expecting the full out space and psych rock of many of those albums, be prepared for something entirely different here. Close your eyes, relax and float off towards the psychedelic horizon. The Universe Is Mental is the perfect soundtrack to that trip. It will take you to vistas both ancient and futuristic, and make them seem one and the same. Aural Innovations(AI): You’ve been playing in the music scene for a long time, originally in more punk and hard rock oriented bands. What first got you interested in playing psychedelic music? What artists influenced you back then? Nick Riff (NR): I came of age when the counter culture and psychedelic era was establishing itself as a concept and lifestyle. Being on the coattails of the Woodstock generation I just took that direction naturally because most of my friends were a few years older and turned me on to hemp and psychedelics as time progressed and the interest in all things psychedelic and mind expanding just naturally occurred. Even in the punk and hard rock bands I was in later on, the psychedelic influence was superimposed in the mix. My earliest influences as far as psychedelic music would be most noticeably The Beatles, Hendrix, Blue Cheer, Moody Blues, Tyrannosaurus Rex, SRC, Pearls Before Swine, and Hawkwind. Then it was on into Yes, early Genesis, King Crimson and Prog rock with the flipside at the same time of the Stooges, MC5, Blue Oyster Cult and on and on. Listening to and living for music 24/7 was probably the biggest influence as a whole. AI: What are some of the artists (old or new) that you’re listening to these days that either inspire you or that you just like? NR: I only have a few hours a week where I can actually check out new music. I listen to Aural Innovations shows of course and a few others as regular as I can, and I listen to college radio where I hear a lot of great new psych type bands but due to short term memory loss unless I write them down when they stand out I couldn't tell you who they are. At this point it all goes into the big melting pot. I like almost everything on the SoundAwesome site. AI: What is the idea behind the Riffdisc series, and how does it differ from your previous releases? NR: The Riffdisc Series is exactly that, a series of limited edition CDs that started in 2006 and will end in 2012 emanating from the official website and monthly newsletter. The idea being that each release has a slightly different focus in regards to lyrical approach and musical style. 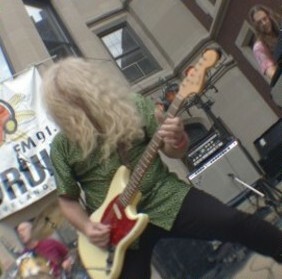 This came about due to the fact some people only like the heavy fuzz psych, some like the etheric acoustic style, and some like the cosmic space rock and the experimental pieces. The previous releases contained all these elements at once depending on the song. My concept for the Riffdisc Series was to separate and expand each element a little more by focusing each release on one of these characteristics and still maintain my musical identity. On a business level it allows me to market each release slightly overlapping into different markets so more people can discover the sounds and then maybe check out a different release as well. Being psychedelic in nature they are also created to be relevant whenever in time they come into the listener’s awareness. AI: The first CD, the appropriately titled Magick Museum was made from earlier recorded tracks, to become a sort of “introduction to Nick Riff”. How did you go about selecting the songs to appear on this album? NR: At the turn of the century the band Freak Element was put on hold because everyone had other commitments. I had a situation that took me out of performing and recording music for nearly five years. Having recorded for Delerium and Sonic Swirl in the 90s with a good number of compilation tracks I realized that a lot of time had passed and I basically had to start over building awareness of my music again. I thought a compilation of those releases would be a good foundation to build the rest of the Riffdisc Series from and like you said, introduce myself again to a new generation of psych music lovers. I picked the songs that over the years kept being mentioned whenever I talked to people or got the most response from the live shows or radio. Bottom line is I just wanted to put together a great psychedelic rock CD that would be perfect to listen to stoned. The original pressing is sold out but is available as download, and we are going to release a re-issue later this year when the official website gets a redesign. AI: Was the Riffdisc concept already in place when you were putting together this compilation? NR: Yes. I also wanted to follow Magick Museum with a studio recording of Nick Riffs Freak Element and bring everything back up to date and enable the series to continue. AI: Riffdisc 002, The World’s Alive brings your old band from the 90’s, Nick Riff’s Freak Element, back together. Was this the same line-up as the 90’s incarnation? NR: Yes same line up. Myself on guitar & vocals, Peter Platten - synthesizers, Kevin Hines - bass guitar, Rob King - drums, with original NRFE drummer Tim Lane - percussion, and Carl Hatcher - sound mutations. The core group of Freak Element is Peter, Kevin, Rob and myself. There's sort of a collective of musicians who know my songs and I have been lucky to be in a situation where I can put together the best band for any given show I might need to play. Sometimes Steve Hayes from Secret Saucer plays synths, or Tim on drums. I have a deep space project with Carl and drummer Bob Bailey that may develop into a separate recording project after the Riffdisc Series is complete. AI: I understand there are two different versions of Nick Riff’s Freak Element, the four-piece rock band and the two-piece psychedelic folk unit. Are there any thoughts or plans to release recordings from the two piece unit as part of the Riffdisc series? NR: The psych folk unit is called Freak Element Duo and it's a way I can present my acoustic-psych-folk songwriter music. Very atmospheric sounding. 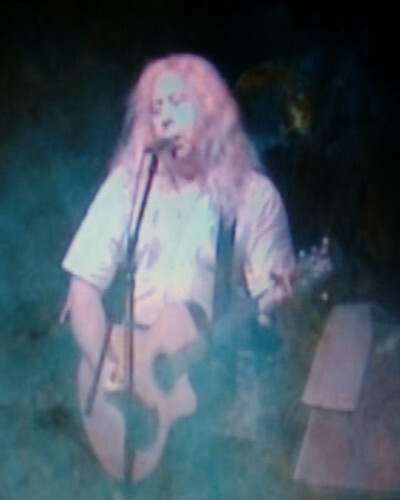 I play acoustic guitar with various effects and Peter accompanies with synthesizers and backing vocals. We released a five song bonus disc as part of the Riffdisc Series with the first 300 orders of Photon Shift called Songs From Another Dimension. I hope we will get a full length CD together after the Riffdisc Series is complete. AI: I loved Photon Shift; it was one of my favourite albums of last year. Photon shift showed a wide variety of styles from psych rock to ambient to folk song writing…even a pulsing dance piece. You’ve said that each disc in the Riffdisc series represents a different side of your musical explorations…which side did Photon Shift represent? NR: The confused side. I tried to keep it in a more hard rock energy and feel with a heavier guitar and drum sound. All the variations of that were only there to keep the listening experience flowing and interesting. Mark KIein from the legendary Cleveland hard rock metal group Breaker produced it. Other than Already Gone and Halls Of Amenti I think the sound is fairly consistent as a psych hard rock set of songs. Mindflow is a soundscape set behind a driving rock beat and I guess you could dance to it around a bonfire on top of a hill or something. AI: Was there a lyrical theme to Photon Shift (the album)? If so, what was the larger picture? NR: We joked in the studio that it was my grumpy old man album. I was at a point of observing the relentless media manipulation of the general population and how easily it is to sway public opinion regardless of the truth. The government is basically a talking head for the corporations, banks, and alien presence that are destroying the planet with no concern for future survival of the human race. Chemtrails, big pharm, war machine, weather control, surrender of personal freedoms without any regard to the documents this country was founded on. Fixed elections…on and on. Then there are the spiritual and metaphysical aspects of the time we are in. The shift in consciousness from the material values into a more cosmic awareness for those who are tuning in that direction as the process begins to manifest, as opposed to the zombie like acceptance of a matrix reality and empty consumer values. So it was sort of lyrically saying wake up while there's still a chance. Mix in some theories of 2012 and the possibility of transcending out of the 3rd dimension as multi-dimensional and quantum realities become more established, and rock on. AI: Already Gone, off of Photon Shift, you’ve said is inspired by a true story. What is the story behind it? NR: The lyrics are literally the true story pretty straight forward. I was visiting my daughter’s family and my 4 year old grandson wanted to look at a book with animals in it. As we turned through the pages I realized many of these animals are already or will be extinct in the wild if not in my lifetime, definitely in his. He was just laughing and showing me the animals without even thinking there would be a world without them. He would show me one and we would say what a beautiful creature it was or something and I am playing along but I was thinking this one’s already gone and trying not to cry. AI: You’ve just released The Universe is Mental, the fourth volume in the Riffdisc series. Inspired, it says, by your recent studies in ‘psychotropic astronomy’. That sounds interesting. What can you tell me about that and how it relates to the music on The Universe Is Mental? NR: The last few years I have been getting back into my astronomy hobby that I spent time with in high school and have always sorta been involved with. I simply added the psychotropics to the equation when possible. I like viewing with astronomy binoculars and scanning the sky until I find a view that is cosmic and psychedelic and spiritual. Then I will stare into that view and sometimes leave. A lot of the music was inspired by some of those celestial sights. I didn't want to make a new age sounding CD which is why I added drums and a couple of structured songs. Photon Shift had a lot of serious lyrical content and metaphysical theories to think about, and that is one of the reasons there are mostly instrumental soundscapes on this one. I also wanted to have music available for licensing to indie films and videos if any filmmakers would be interested. Looking into outer space or inner space is only a perspective. I just made a CD of music that would complement both directions to complete the circle. AI: Your website also mentions your studies in Paleo-rhythms. What did you learn about those rhythms that inspired you? NR: Again, the astronomy connection relating to the speed of light and time. When staring into space you are looking back into the distant past and I was thinking the same sky I was seeing was the same sky that Paleolithic people experienced. In fact they saw more because there was no light pollution. I related to the universal rhythms that haven't changed and the human heartbeat and breathing. Most of the CD there is only one drum playing the most primitive beat I could take it to in regards to all the technological and space music going on around it. I just beat it like a caveman to create a trance state that could help the listener space out. AI: You called it a kind of “new age punk”. I get the new age influence, but punk? I know that you had some of your roots in punk bands and in your more rocking tunes you can still hear touches of that influence, but what is punk to you about the music on The Universe Is Mental? NR: That was something I thought was hilarious because there are all these spacey echoes and drones that might be tipping into new age type music and I am just beating the crap out of this drum. There’s nothing punk rock sound wise or musically about it, just the way I was playing the drum that was so primitive I just came up with that phrase. You can't take that phrase in terms of rock music, you have to see it from my distorted reality. AI: I love that you take risks and do your own thing, like putting two gentle psychedelic ballads on The Universe Is Mental in total contrast to the rest of the music. Is there a method to the madness or do you just like to surprise the listener with the unexpected? NR: The idea of the song Forever was simply a pause after the first four tracks. The concept of that song was to be like a spaceship traveling through space and picking up an old radio broadcast from Earth bouncing off a distant star. That's why it has a fifties doo wop early sixties AM radio feel to it. I guess if I had put some static and short wave signals first people would have understood why it's there in relation to the rest of the music. With the last song, Heaven, I wanted a chill out after the intensity of the three previous tracks, and you could roll credits over it at the end of a tragic or victorious love story movie. think it's a very psychedelic song in its own way. AI: I loved the title of Sumerian Spaceport. I assume it relates to the ancient astronauts theory. What are your thoughts on that? NR: It's a thread that runs through the entire Riffdisc Series. If you look at the Magick Museum cover it's a 6000 year old tablet that clearly shows a flying machine surrounded by stars and planets coming in for a landing. There's just too much evidence to dismiss about the subject. People should research the more involved scholars who have written books about it. It just seems logical. Why did the US military immediately raid the Bagdad museum? Some of those artifacts still work. Ancient astronauts, multi-dimensional time portals, spirals in the sky, planet X, angelic beings, it's all in my psyched out reality. AI: Implant Procedure Explained definitely has a different feel from the rest of the instrumental pieces on The Universe Is Mental, being more edgy, alien and futuristic. What’s the idea behind it and how does it relate to the other pieces? NR: The complete title was going to include the phrase (In real time). There are three aliens explaining each phase of the operation. The abductee is in a dream state but conscious on a table. The first phase they introduce themselves then explain the instruments, then proceed to make the laser incision over the area of the 3rd eye and separate the skin layers to the skull. Next, there’s a description of how the laser will cut a small square in the skull exposing the brain. Once the brain is accessed the laser opens a passage directly to the Pineal Gland and there is a short pause to stabilize the subject. Finally a micro thin transparent film is overlaid on the gland and a frequency initialization occurs. From this point it is simply a matter of using the laser to close the incisions and return the abductee to whereever they were before the procedure took place. It takes about ten and a half minutes and the matrix reality projection superimposes itself through the film chip on the subject’s perception of reality. These beings have nothing to do with the previously mentioned ancient astronauts. AI: Any hints as to what is coming up in the Riffdisc series? You’ve said you plan to finish up the Riffdisc series in 2012. Since this coincides with the Mayan prophecies and that number is part of your e-mail address, is there significance to finishing up the series in the year 2012? NR: I have two more CDs planned and will hopefully have them released by the end of 2012. There are so many theories about that date I just thought it would be a good time to end the Riffdisc Series since one of the end of the world theories is that date as well. I don't think the planet ends, just changes, and we are obviously in the initial stages now on all levels in the physical world and consciousness. I really don't have any big prophetic statement about it. I just think it's time to get yourself to wherever you need to be to survive mentally and spiritually. If there is indeed a photon shift in consciousness or rapture or dimension shift or alien intervention the only reality is going to be how this relates to the individual in relation to the creator source. The properties of quantum physics and the multi-verse may become reality in the blink of an eye to some and to others just another day. If the Universe is Mental, is there an answer? AI: Thanks Nick, for taking the time to chat with us!